We all love a good foot massage with the best foot cream as well as that amazing and refreshing feeling we get after ex-foliating and moisturising properly. So, why not do it more often? It can easily become a habit to overlook the seriousness of taking care of your feet, but what you don’t know is that there are some foot-related problems which can have an impact on your general health. Dry, itchy skin, cracked heels, bacteria, fungus, all sort of aches, pains and conditions will affect the quality of your life if you neglect foundation of your body. If you have very cracked heels, you should have a prescription treatment from a dermatologist. If they are not that bad, there are a lot of moisturising products on the market, that are promising soft and healed heels. You may find yourself in a riddle when it comes to choosing the right products since the industry is filled with all sorts of lotions, creams, oils, all advertised as being the best. In order to help you make up your mind about which products are actually going to make a difference, we made a list of several miracle workers, which will give you the same feeling as if you had a professional treatment in a luxury and pricey spa. For best results, apply these products after your daily foot massager session, when your feet are relaxed and ready to absorb moisturise and its nourishing ingredients. 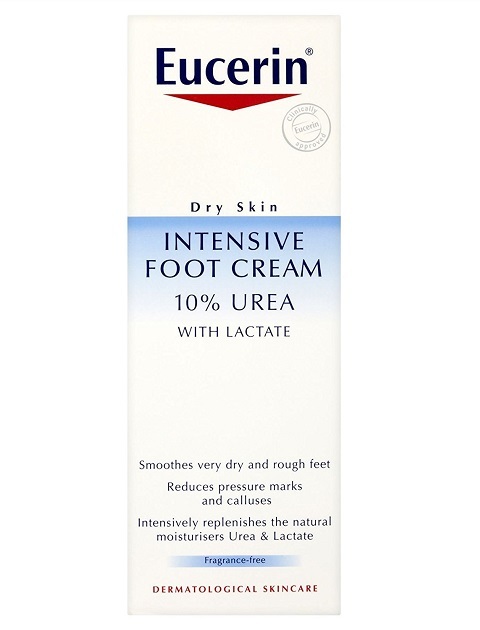 Eucerin Dry Skin Intensive Foot Cream is the ideal remedy for severely dry feet. It was designed to stimulate the natural healing process of the skin by hydrating it and regulating the pH balance. What makes this cream one of the best selling products is not only the fact that it is cost-effective, but the concentration of ingredients from which it is made, especially 10% concentration of urea and lactate, the body's own natural moisturisers. Containing 25% urea concentration, Flexitol Heel Balm is regarded as one of the top creams for cracked heels available on the market today. Urea is a popular ingredient found in most skin products due to its ability to moisturise the skin and exfoliate at a deep cellular level. Flexitol Heel Balm is quite creamy and doesn’t have any scent. It is excellent for people with sensitive skin as well as diabetics. The CCS Swedish foot cream is the best option recommended by foot care professionals for people suffering from hard skin. It is very moisturising and contains urea which helps breaking down and preventing ocurrence of any hard skin so you get long lasting effects. You can increase its effect and keep your feet in great condition by using it regularly with an electric pedi. In addition to the 3 recommended options for dry feet, hard skin and cracked heels, we have listed below a number of other great foot creams that you may consider when searching for the best foot cream. Burt’s Bees Coconut Foot Cream is also one of our favourite foot health products. Once you apply it on your skin, you’re instantly feel the thick texture nourishing your feet. Made of 99.4% natural foot cream, its ingredients are a delightful mixture which will surely spoil your senses. The coconut oil base is the key-ingredient due to the fact that its composition is known to have many benefits: it acts as a shield against microbial infections, it is a very powerful antioxidant and it can repair hardened and cracked feet. To complete the list of ingredients, this moisturiser also contains rosemary and peppermint extracts which will leave your skin feeling rejuvenated and smooth. It can be used as a daily cream as well as an overnight foot regimen. Tea Tree Oil Foot Spray is just the treat your feet are longing for. This spray from Earth Therapeutics is perfect for the cold season, when you’re killing your feet with heavy footwear and low temperatures and it can be just as well used during hot summers, when you’re going barefoot and you need a protection. Its ingredients are an ideal combination of powerful antioxidants and healing plants, the peppermint oil and wild mint are going to simmer down your skin and invigorate it, while the aloe Vera leaf juice and chamomile extract will let their nourishing-properties do the trick, the ylang ylang oil is going to pamper and relax the skin, and last but not least the tea tree leaf oil will act as a strong anti fungal, protecting your feet. Unlike other products, this spray has a light and pleasant odour so you won’t have to go around smelling like an air refresher. Besides these, it has the property to deodorise feet while gently cooling and smoothening them. L’Occitane Shea Butter Foot Cream is also one of our top recommendations. Carefully manufactured in the heart of the Haute-Provence, in Manosque, this deeply moisturising cream is embellished with 15% shea butter assuring the comfort, repairing and protection of your skin. Its formulation contains vivifying lavender essential oil and arnica extract known for its antibacterial and anti-inflammatory properties, speeding up the healing process. This foot cream is a slice of Heaven in treating tired and hardened feet, while people who used it described its effects as “bringing the feet back to life”. You can trust this product all the way since it was also awarded by InStyle Best Beauty Finds in May 2013 and in 2012 at the InStyle Best Beauty Buys. The Naked Bee Restoration Foot Balm is a winning addition to your care routine. This restoration foot balm is going to nurture your cracked and dried feet, leaving your skin wonderfully scented with a Orange Blossom Honey fragrance. Made completely of organic ingredients, contains in its formulation neem and meadow foam oils giving you the perfect foot therapy effect, leaving your skin as smooth as silk and hydrating it. The product is not animal tested, has no drying alcohol and it’s gluten-free, while its price fits every pocket. PROFOOT Heel Rescue Foot Cream is our last suggestion for the well-being of your feet. This rich and luxurious cream, yet not oily, can treat even the driest, most cracked and calloused feet. Specially created to penetrate your skin, moisturise and start-off the healing process, you can’t go wrong with it. Due to the fact that it is enriched with Moroccan Argan oil also known as “liquid gold”, it has the necessary properties to offer your skin the mind-blowing experience it has been longing for. For an even better effect, apply it on your feet before going to sleep, put your socks on and leave it overnight, you’ll have a great surprise in the morning. We’ve all been at that point where we just stare confused at tons of products, not knowing which would be the best pick. For optimal foot care regularly spoil your feet, gently wash them with mild soap, ex-foliate them once a week and apply adequate products including your best foot cream. You’ll be amazed how fast you can see and feel the results. Why use heel or foot creams? An effective heel balm can be excellent in soothing dry feet as it alleviates any discomfort caused by the dryness. For example, it can help minimise any pressure exerted on your foot whenever you have a dry spot on that particular foot. 2. Protects you against foot infections. If you’re suffering from heel cracks, chances are high that you will develop various forms of bacterial and fungal infections. Unfortunately, some of these infections may take you years and lots of money to treat. Thankfully, a good heel cream may be all you need to prevent these infections. Once your feet are cleared of the hard skin, it is recommended that you continue applying a heel cream for a while longer to ensure that the soft skin beneath is protected from further cracks and that hard skin doesn’t re-form immediately. Let’s admit it. Nobody wants to be seen with hard, flaking skin on their feet when wearing sandals or heels. Fortunately, a great heel cream can help to restore your feet skin to their normal pink, plump feel in a very short time. If you fail to drink sufficient amounts of fluids, your body becomes dehydrated. This effect will possibly be transferred to your feet which then end up becoming dry. As such, it’s important to keep your body hydrated at all times to maintain soft feet. This mainly applies during cold winter months when circulation tends to drop drastically. Unfortunately, it is your feet that are affected the most and thus they do not receive sufficient water and nutrients. As such, it is crucial to keep your body warm during this time to enhance circulation. 3. Take regular body checks. If you suffer from conditions such as diabetes or poor circulation, it is likely that you will develop hard skin. As such, be sure to take regular body test to arrest any of these conditions as soon as possible. If you take long hot baths, your skin gets stripped of its natural oils and moisture which can leave your heels dry and possibly with cracks. If overweight, the pressure exerted by your body on your feet can aggravate the cracks on your heels. As such, try to cut on your weight especially if you’re severely overweight. Some soaps and beauty products contain components that dehydrate your skin and strip it its protective oils. As such, choose your products more wisely the next time you’re shopping. 7. Be keen on the shoes you wear. You may want to avoid ill-fitting shoes as they can cause excessive friction and pressure on your feet. Besides, wearing open back shoes for an extended period can cause your foot skin to expand and harden. This tip mainly applies to people who walk or stand for long periods. Doing so can lead to hardening of your heels. As such, consider taking regular breaks by sitting or elevating your feet after standing on your feet for a while. Avoid walking around barefooted especially on hard grounds as this can place pressure on your heels. As such, it is recommended that you wear socks or slippers which helps to absorb some of this pressure as well as minimise friction. One of the best ways to keep your heels moisturised is by applying a good heel balm. Fortunately for you, you have eight top options to choose from as reviewed in an earlier section of this article. For best results, consider applying your cream daily just before retiring to bed. Q: What are the benefits of using foot cream? Foot cream moisturizes, softens and soothes dry and/or cracked feet. Using natural ingredients such as essential oils, foot creams re-hydrate your skin and exfoliate away hard skin. Certain ingredients promote faster healing and provide antibacterial protection – two big benefits for people with cracked heels. But you don’t need to have a particularly severe foot condition to use foot cream. You can apply it daily just to keep your feet soft, supple and fresh. It can actually help you avoid cracks and dry skin that most people are trying to treat with foot cream. Q: Can I use foot cream for corns and calluses? Most foot creams contain ingredients to reduce the inflammation that accompanies corns and quicken healing. They also moisturise and soften the hard skin. For painful or irritating calluses and corns, foot cream provides instant soothing relief. Q: Can I use foot cream on my hands? This mostly depends on the particular kind and brand of foot cream you are using. Most foot creams are safe for the skin on your hands. But some foot creams are formulated for use on feet only and are not recommended for hands. This is because the skin on your hands is much thinner and more delicate. If you want cream you can use on your hands and feet, there are some companies that make general purpose creams. But it’s best to get one cream specifically for your hands and another for your feet. This ensures that you give each the most effective treatment and care. Q: Is foot cream good for diabetics? There are several foot conditions that are caused or aggravated by diabetes. The most common ones include dryness, fungal infections, calluses and nerve damage among others. The right foot cream can help you manage all these problems. I recommend buying a foot cream specifically formulated for diabetics. It will be more effective compared to a normal foot cream. Diabetic foot creams contain special ingredients to prevent fungal infections, improve blood circulation, moisturize your skin, provide pain relief and speed up healing. Q: Can foot cream help with athlete’s foot? Yes it can but you need to buy brands that are specifically formulated for treating athlete’s foot. As with diabetic foot creams, athlete’s foot creams have specialized ingredients to quickly sooth the itching and burning. They also contain anti-fungal ingredients to protect your feet from further infection and quicken the healing process. Q: How do I apply foot cream? Check the application instructions on the tube or the leaflet accompanying the cream. The exact application process varies depending on the specific type of cream you are using. But here are some general tips that apply to most foot creams. Clean your feet. Start by washing with soap and water and then soak in warm water for around 20 minutes. You can add Epsom salt and some essential oil to the water. If you’ve not exfoliated your feet in some time, do it. This will make the cream more effective. Be gentle if you have cracks or calluses. You can use a pumice stone, a foot scrub or an exfoliating cream. Apply the cream and massage it properly into the skin. Q: When’s the best time to apply foot cream? In the evening just before you go to bed. This maximizes the effect of the cream since you don’t have to wear shoes. But check the instructions on the label. Some creams need to be applied twice a day. Q: What is in foot cream? Ingredients vary a lot based on the type of foot cream and the condition is meant to treat. Here are the most common ingredients. Urea – This is an ingredient in most foot creams. Urea is a humectant, meaning it retains moisture. This makes it an effective moisturizing ingredient. Natural and essential oils – these include coconut oil, tea tree oil and Shea butter. These oils help moisturize and soften your feet. Some of them also have anti-fungal and anti-bacterial properties. Lanolin – this is a type of oil that’s extracted from sheep’s wool. It is used as a moisturizing ingredient for dry and flaky skin. It also soothes away irritation and itching associated with conditions like athlete’s foot, corns and calluses. Note: Always read the list of ingredients before buying a foot cream. Check for any component you might be sensitive or allergic to. I hope you are fine, I am Jackie from Kampala- Uganda. I am 46 years old and I have challenges on the lower part of my body. I have varicose veins, edema, cracked heels, ugly nails, cones and calluses and some parts of my soles have dead skin. I also have a hard growth on the sole of my left foot, it feels like a wart. I feel like it grows inwards and outwards because when it is almost protruding, I begin feeling a sharp pain deep down and on top. When the pain is unbearable, I cut the protruding part with a razor blade and I move on for another two months, I am tired of this because I imagine that even the doctors may not help me. I have seen the various options you have advised, kindly point out products that are more multipurpose because if I try out a product you have recommended and I love the results, I will look for capital and turn it into a business because this is an area that affects many ladies and gentlemen as most of us are subject to all the causes that you have written about. Our market here is flooded with many types of foot creams which I fear to try because I do not know whether they are effective plus I want to buy a product a knowledgeable or exposed person like you has recommended. I will be grateful if you meet my request. Thanks for this overview of best foot creams. I like Shea Butter Foot Cream from L’Ocittane very much.